This guide does not address converting transaction history. If you would like to convert data beyond what is listed above, such as transaction history, there is a Sage to AccountEdge Conversion Service available. For more information about this service, click here. The first step is to pick a start date, which will be the day you begin using AccountEdge to enter all of your transactions for your business. From that day forward you will no longer enter transactions in Sage. Your Sage file will now become your 'file cabinet'. You can easily look back to your Sage file to run reports and view historical transactions. Most business owners look back much less than they think over time. Typically you would want to start at the beginning of a month, quarter or fiscal year. Each has its plusses and minuses so pick the date that is most realistic for you, even if it means re-entering some data into AccountEdge. For example: it might be two weeks after the quarter ended, so you may want to re-enter the last two weeks of transactions in AccountEdge. While starting with AccountEdge at the end of a financial quarter or fiscal year is most common, you can switch over at any time that works best for you. Take a few minutes to read through the following articles to familiarize yourself with AccountEdge. Reviewing these articles first will help you successfully convert your data later in the process. The key to bringing your data from Sage into AccountEdge is being comfortable working with data in Excel, understanding the fields available in Sage and AccountEdge, and using Excel to maximize the data you convert. A quick trick to get familiar with the AccountEdge data format is to export data from our sample Company File, Widgets Coffee Co., which is included when you install AccountEdge. This is the best way to match your existing data with the correct field names that AccountEdge will use when you import your information. 1. 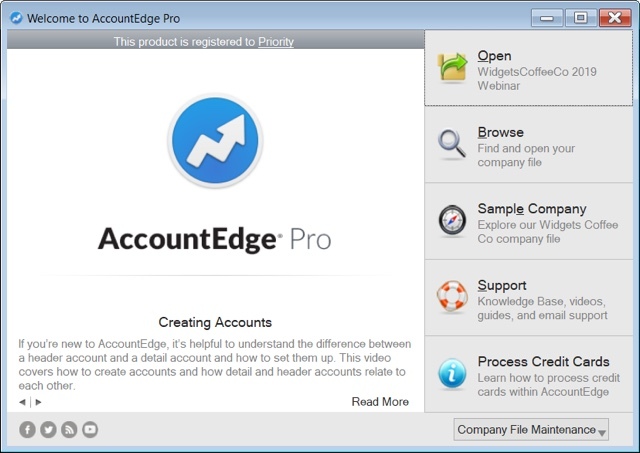 Open AccountEdge and select to open the Sample Company from the AccountEdge Welcome Window. 2. Click on File from the top menu bar and then from the drop-down select Export Data > Accounts > Account Information. 3. Keep the defaults on the first window, click Continue. 4. Select Match All to export all available data, click Export. 5. Save the exported text file (.txt) to your desktop, so it is easy to locate. 6. Open the new text file in your spreadsheet software to view in an easily readable format. Use these exported files as a tool to help you better understand the AccountEdge field names and types. They will also help you match and import your Sage information correctly in AccountEdge. Follow the same steps to also export Customer Cards, Lead Cards, Vendor Cards, Employee Cards, Items, and Activities. AccountEdge fields marked with an asterisk* are required and must be filled in for a successful import. Fields marked with a caret^ are conditional fields. When importing, at least one of these fields must contain valid entries for matching fields in the company file. When you begin exporting your data from Sage, take some time to carefully review the Excel files you create. We suggest you delete any data you won’t need moving forward (accounts you don’t use, old customers and vendors, items you no longer sell). Back Up. Back Up. Back Up. Make copies of your AccountEdge Company File after completion of each step. This will allow you to easily restart a step if needed without having to start over completely. Before you get started converting your Sage data, you will need to install AccountEdge on your computer. Once installed, it is time to create your new AccountEdge Company File. To begin, launch AccountEdge and select Create from the Welcome Window to start the New Company File Assistant. You can also create a new Company File from the drop-down menu on the bottom right of the Welcome Window, click the Company File Maintenance drop-down and select Create Company File. When you get to Step 4 in the setup process, Accounts List, you have a choice on how you would like to set up your chart of accounts. You can start with a chart of accounts provided by AccountEdge or import your own list. I would like to start with one of the lists provided by AccountEdge. AccountEdge will add an accounts list based on your business type that is commonly used by other similar businesses. If you do not have an existing accounts list, choose this option. I would like to import a list of accounts provided by my accountant. You can import an accounts list provided by your accountant or from a previous accounting system. Your new file will be set up with the bare-minimum accounts required by AccountEdge. You will be able to import your accounts list after you complete the New Company File Assistant. I would like to build my own accounts list. Your new file will be set up with the bare-minimum accounts required by AccountEdge. You will be able to add accounts as needed when you begin entering transactions. If you do not have a detailed account list in Sage, it may be easier for you to use one of the default lists from AccountEdge and enter in your opening balances as of your switch date. When creating your company file, you can select I would like to start with one of the lists provided by AccountEdge. From there you can choose your Industry and Business Type, and AccountEdge will create your list of accounts. You can edit, add, and remove accounts from the default list, and easily add your opening balances to your accounts. For more information about Creating Your AccountEdge Company File, click here.